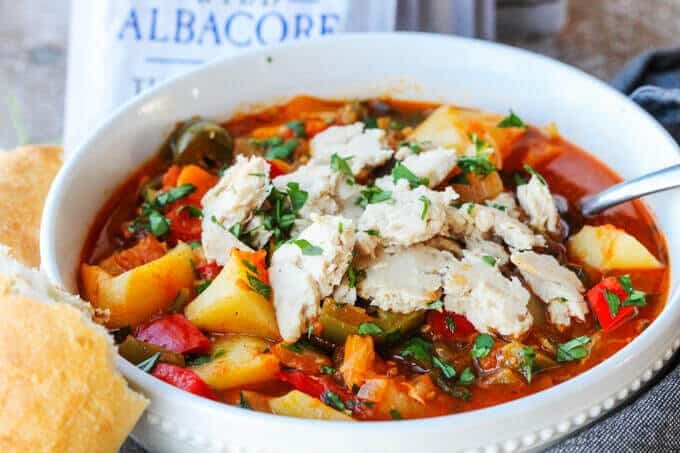 This post is sponsored by Blue Harbor, a producer of sustainably caught tuna that I used in this Spanish Style Tuna Stew with Potatoes, Peppers and Tomatoes. 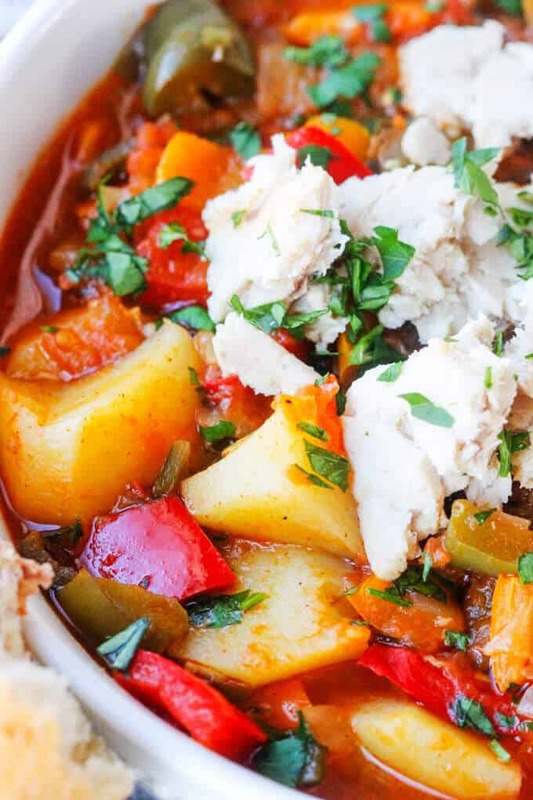 It’s a healthy, clean-eating type of meal that comes together in no time and it’s perfect option during this Lent season. I grew up in Poland, which is a very devote Catholic country. As such, Lent was always a big part of my life. When reflecting back on my observant youth, I think one of the biggest restrictions for me during Lent was to avoid huge parties. The other big part of the Lent is to abstain from eating meat. Now, I’m not sure if this was in an effort to prove our devotion, however meat-less days weren’t just reserved for Fridays’, but were observed for all 40 days! And if you know anything about Polish cuisine, this was a tremendous ask. 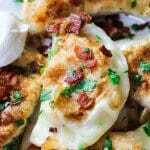 However, apart from the traditional dietary restrictions of fasting and incorporation of meatless diet, Catholics also self-impose other restrictions as a form of penance. For example, some people may give up chocolate, or others may give up seeing movies. I guess it’s all about depriving yourself of something you enjoy and then sticking to it. 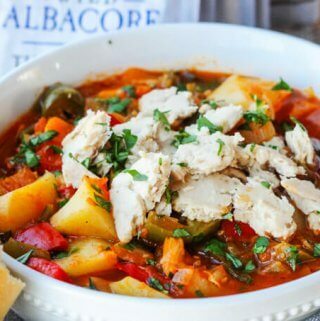 I became very excited when I was presented with an opportunity to work with Blue Harbor and create a recipe for Lent using their Albacore Tuna. 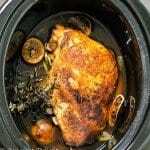 Now, I will get to this Spanish Style Tuna Stew recipe in a minute, but first wanted to say a few words about the tuna. It is so difficult nowadays to figure out where your fish is coming from and what methods were used to catch it. 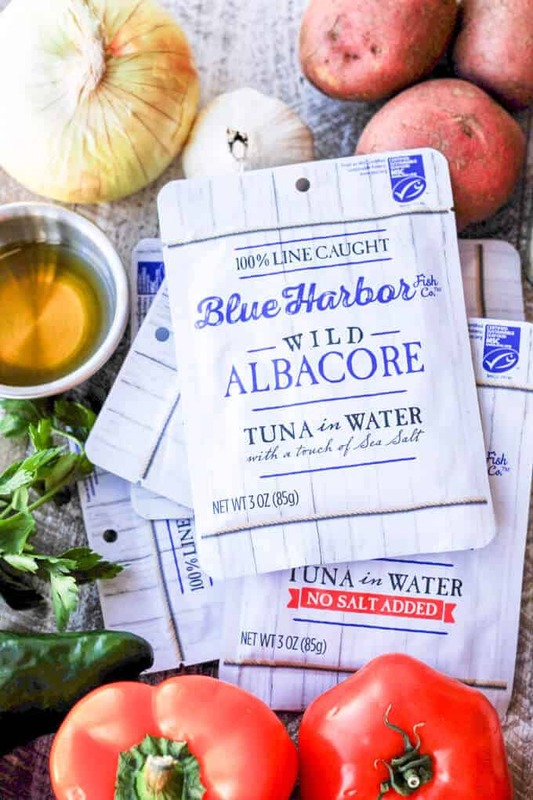 When buying Blue Harbor Albacore Tuna you can be sure that it’s both wild and sustainable. Blue Harbor is MSC Certified, which means that it complies with sustainable practices and ensures that each fish is traceable to a specific boat. Isn’t that cool? 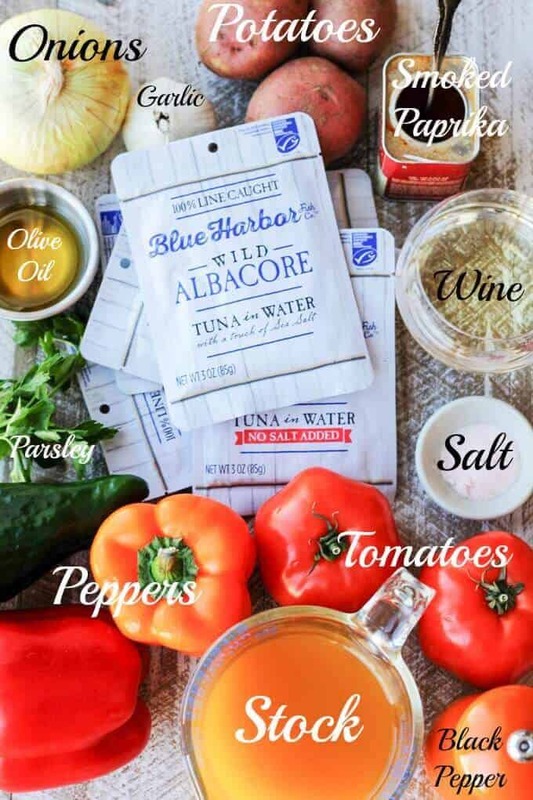 Blue Harbor Albacore Tuna comes in convenient 3 oz. pouches that don’t need to be drained. Which makes them so easy to just toss into your bag for lunch, either on a piece of bread or over some lettuce. You can choose either a pouch with a touch of sea salt or one with no salt added. I used the one with sea salt for my Spanish Style Tuna Stew recipe. But you have the option to use whichever you’d like. 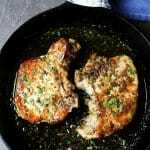 Both types offer a delicious, mild and clean flavor. So, what exactly is in this stew? As you can see, all the ingredients are clean, unprocessed and super healthy. 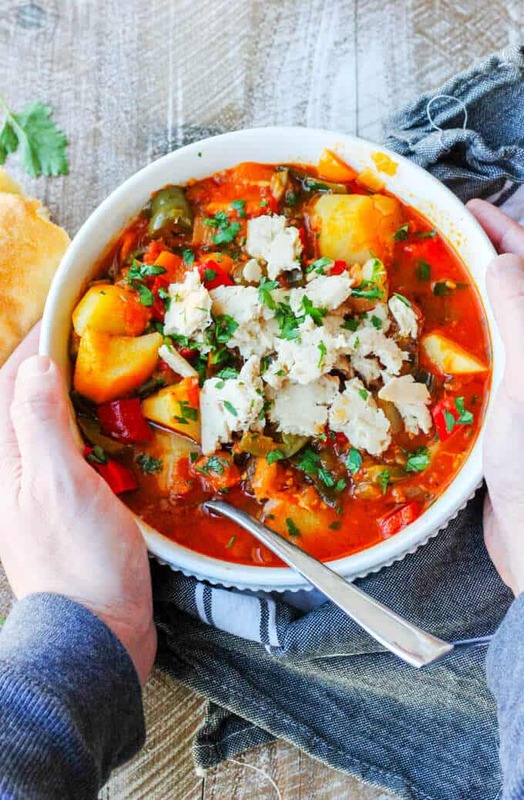 This recipe for Spanish Style Tuna Stew is based on a traditional Basque dish called “Marmitako”, where fisherman used to make it right on their boats immediately after they caught their Tuna. I used Blue Harbor Albacore Tuna here, as I really like the fact that I can figure out where it was caught. Now I can have this amazing, clean recipe with all these wonderful ingredients. And the best part is…? it tastes out of this world delicious! The smoked paprika makes it super flavorful and it pairs wonderfully with this mild, delicious tuna. 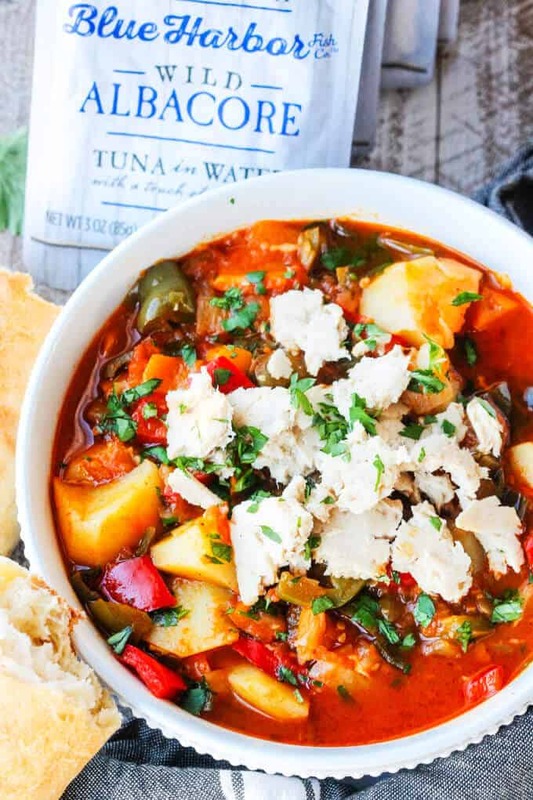 Do yourself a favor, go to your local grocery store (listed above), get yourself Blue Harbor tuna, and make this amazing stew. You won’t regret it. 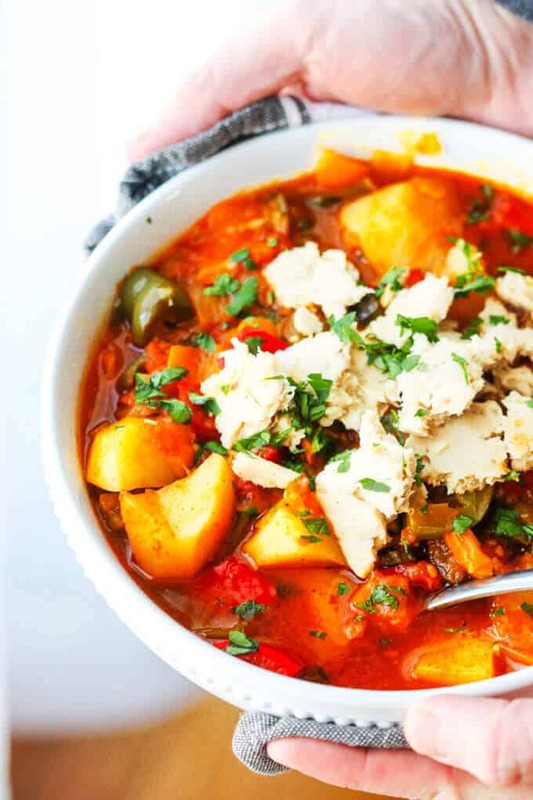 Spanish Style Tuna Stew with Potatoes, Peppers and Tomatoes is a healthy, clean-eating type of meal that comes together in no time and it’s perfect option during this Lent season. Stir in tuna, sprinkle with parsley, drizzle with remaining tablespoon of olive oil and serve with crusty bread. * When you break potatoes instead of cutting them, they will release more starch into the broth to thicken it up. In order to break potatoes use pairing knife, start cutting it and then break it before it is totally cut. Continue in the same fashion with the remaining potatoes. I am a huge fan of tuna but have never eaten it in this manner. What a delicious dinner idea. 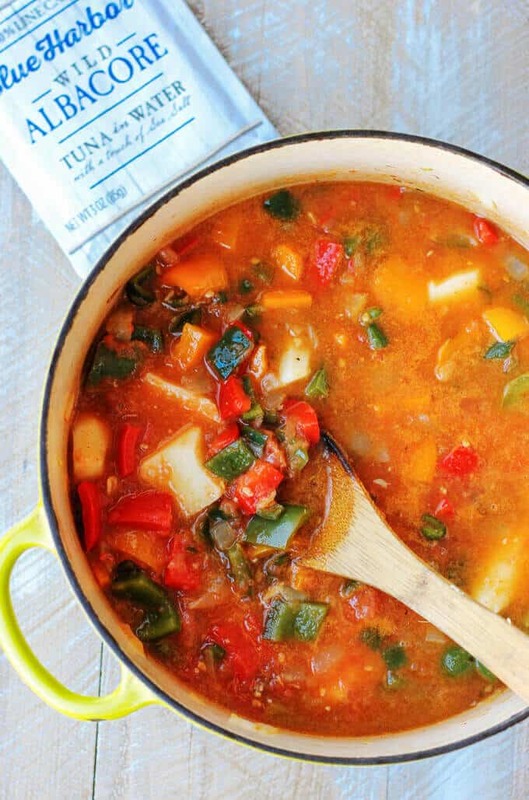 We love this brand of tuna…it must be delicious in this recipe. I love anything with a strong Spanish influence. This is a great way to use tuna, and something a little different too. Your photos are exquisite! This is my kind of meal and perfect for Fridays during Lent. I loved hearing about Blue Harbor as well. Thanks for sharing! Thanks Andrea! It is perfect for Friday during Lent.